Byron: Glenn, when I was speaking of religion in the Philippines, I was speaking about the indigenous people’s original belief system. There were many. Before the Philippines were taken from the native peoples. I’m sure they were more like the native American religions. Interesting . . .
Glenn: Byron, I’ve gone through the article from the link you sent to me, but I guess, this requires much research and time for me to presently get into. I can only speak of my brief meeting with the Tagbanua tribe in Palawan when I stayed for half a year in Narra, a few hours north of Puerto Princesa. My brief meeting with the tribe was not really that significant. An anthropologist- friend, Israel Cabanilla, who used to work with Robert Fox mentioned to me quite a number of stories of his encounters with a few unknown tribes. Of those tribes already known, they by now, dress, behave, think and live almost the same as the rest of the lower classes of our society, although not in a similar habitat. They cater to the needs of residents and tourists around their areas. I had met with one tribe in Palawan numbering around 14 members. Our meeting was brief and I was not at all interested in documenting and exposing them, lest they become like the rest of us. I did a bit of doodles about their tools, weapons, clay pots, instruments and basketry. In general, most of the tribes my friend knew of, and those I met were gentle people. The only danger my friend once encountered was when a ritual dance was done in his presence to clarify his status with the tribe, that is, if the half-cut neck and head of a chicken shifts left, he would be an ‘enemy’ of the tribe, and when it shifts right, he would be a ‘friend’. 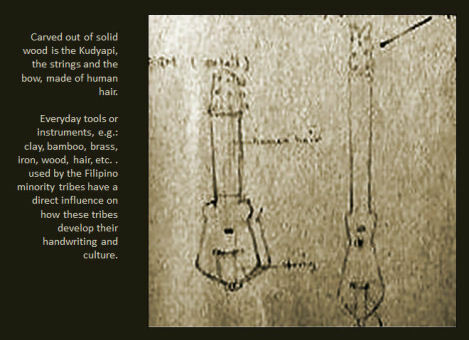 Members of the tribe, according to my friend, use a similar instrument which they call, “saluray”, made of bamboo where long and short string-like skin of the bamboo are wedged out to create sound when plucked, much like banging a guitar. However, what makes this instrument more interesting is, when played in real life as a ritual, it is used to dance with while crossing a ‘bonfire’ numerous times, while beating the saluray on to their chests, chanting until they hallucinate. Of course, some forms of drug, or “betel nut” may be taken to enhance the ritualistic dance. This is somehow, indicative of how a tribe copes up with decision making, based on an induced natural phenomenon. Somehow, nature, or its behavior is their basis both for their physical and spiritual longings. So, the elements: fire, water, earth, air, wind, sun are always there for them to react to and make use of the best way they can. Along the way, superstitious beliefs are formed and they are too many to mention, passed on from one generation to another. My correspondence with Wawi , a great young visual artist, is the reason why we have these cyber-pages of my research on Filipino phonetic-syllabic handwriting. 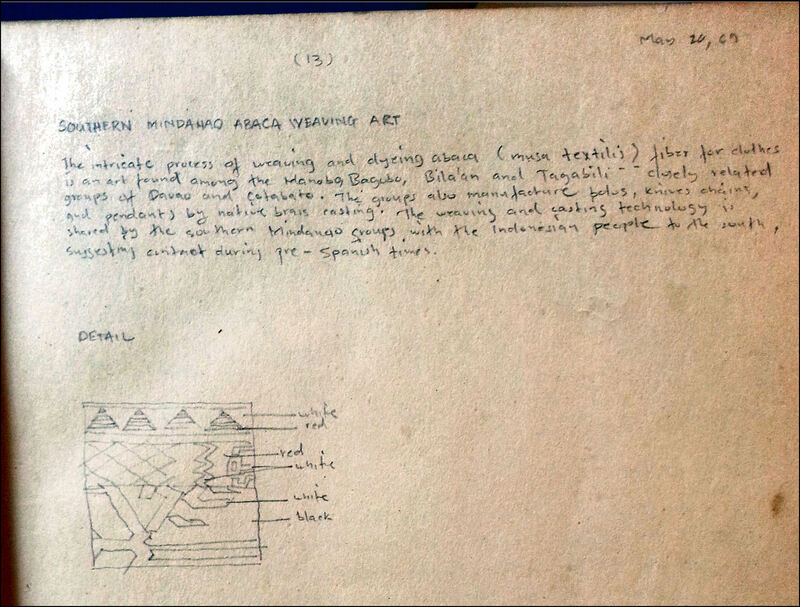 I had to go back to the some stories behind for the readers to understand the significance of such exquisite handwriting, which topic got initiated upon Wawi’s invitation to a lecture on the Mangyan tribe. And this page I am writing about started just because of my 11 year old son’s urgent desire to communicate solely with his intimate friends in school to avoid being understood by his other classmates who do not really belong to their so-called “culture”. At first, it was my German book that he tried to learn and share with his friends but, proving to be too difficult and taking too long to learn, David thought of other ways to communicate which would not require so much study and research. He was starting to make his own drawings, alphabets and icons that may only be associated with his group, but finally stopped in desperation in achieving his goal and shifted his interest to “rock climbing”. 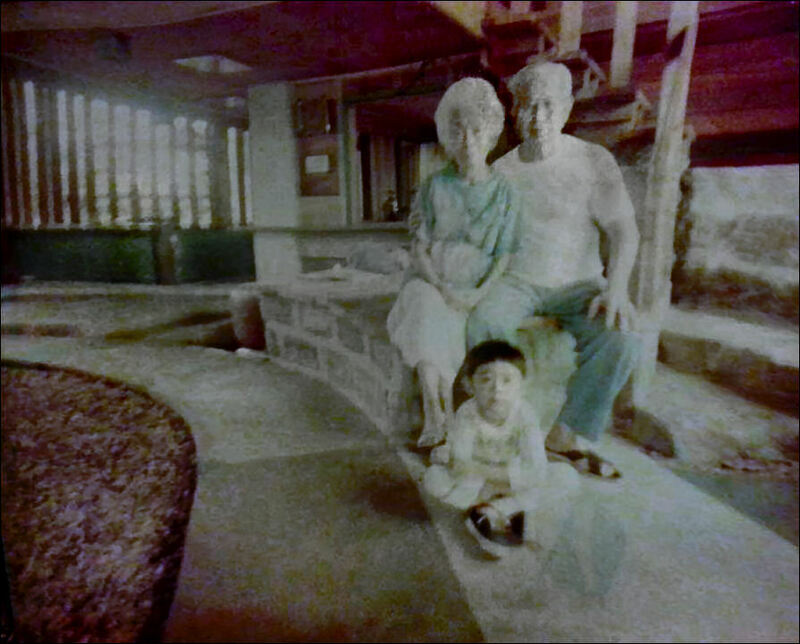 Here’re his leftovers and a few notes I did in Palawan and at the National Museum. So far, I have not heard of any effort done by the government, nor any of our scholars of the vernacular or national dialect which is Tagalog, to digitally transform the original Tagalog Phonetic/Syllabic to digital icons that may have their applications to the present confused Filipino society. 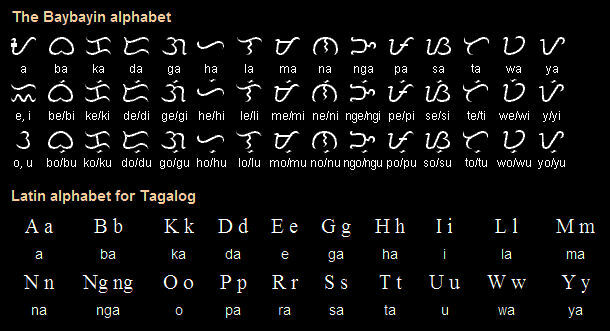 My experience tells me that truly, these original Pre-Hispanic alphabets can have their present applications for I had used this Tagalog handwriting to communicate with my ex-German wife, writing each other in Tagalog, English and German, for writing the sounds of any language with these Tagalog Phonetic/Syllabic Alphabets is what makes it work and be understood. 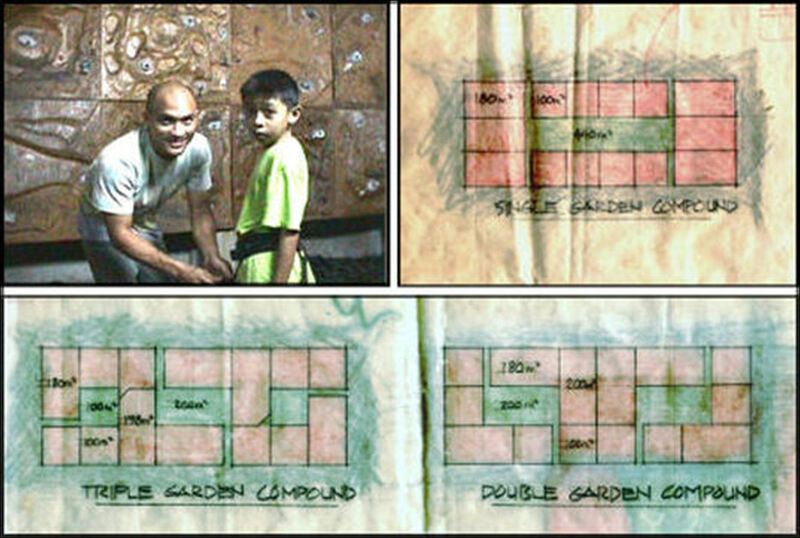 an amazing young visual artist, is the reason why I decided to feature some pages from my brief research on Filipino Phonetic-Syllabic Handwriting on this site. For the readers to understand the significance of such exquisite handwritings, I had to unravel some stories behind this calligraphy which topic got initiated upon Wawi’s invitation to her lecture on the Mangyan tribe. “Discovering this page is like unearthing some ancient forgotten relic, Glenn! Thanks so much really for sharing the information. Now that the scripts and characters are here, I can start writing secret messages and poems and posting it on public places”. you see, wawi present texting is like how the early ‘pinoys’ wrote to express themselves, that is, phonetically . . d, ba? 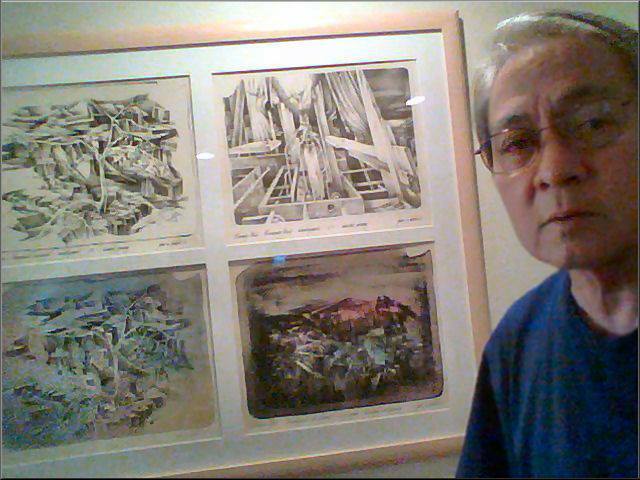 – – but writing again, at present, with such beautiful Pinoy icons cannot be less fulfilling but will perhaps bring back the Pinoy’s lost identity, also similar to shorthand, only I don’t know how, do you? Syllabic-Phonetic Filipino Handwriting / The single outstanding object recovered during the Calatagan excavations was an earthenware vessel with Tagalog syllabic writings on the shoulder. Although it is known that at least sixteen (16) different groups were literate in syllabic form of writing at Spanish contact, (the writing is of Indic origin probably brought in to the Philippines by the Bugis, (great traders from Celebes) this is the only object from a pre-Spanish archeological site with syllabic writing. Unlike my father, David’s grandfather (now at the hospital in Los Angeles, CA, struggling with his life) , who writes much like the Mangyan tribe with his diagonal and straight line handwriting, David and I opted to depart from the syllabic, phonetic writings of the Tagbanua tribe admiring the seemingly romantic, soft and rounded strokes of their handwriting. David’s ability to adapt the chosen syllabic symbols to his needs and eventually to my needs too, led to a new form of syllabic / phonetic writing which at the present moment, only David and I can understand. We’ve decided to call it an international form of writing because our revision from the Tagbanua’s handwriting may be used to write any international language or local dialect provided that they make sounds. David’s reluctance to share this with others, other than his close friends, has created a new conflict between us. Time will tell whether I can share this new handwriting with others for, at the moment, I am inclined not to disappoint David. The inscriptions featured here were the first syllabic writings David attempted to share with his group. He has done many more but likes this version the most. ”I kinda like it too.” If you are interested in learning it, please write to David for I know he’s bound to change his mind. 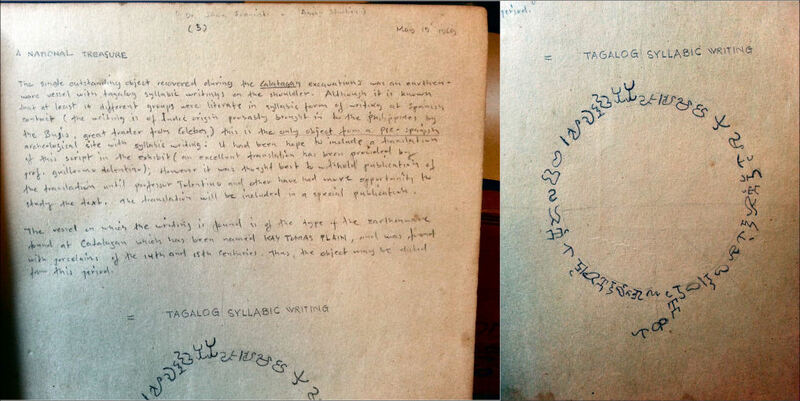 It had been hoped to include a translation of this script in the exhibit (an excellent translation has been provided by Prof. Guillermo Tolentino); however it was thought best to withhold publication of the translation until Prof. Tolentino and others have had more opportunity to study the text at length. The translation, according to the National Museum will be included in a special publication. The vessel on which the writing is found is of the type of the earthenware found at Calatagan which has been name KAY TOMAS PLAIN, and was found with porcelains of the 14th and 15th centuries. Thus, the object may be dated from this period. The intricate process of weaving and dyeing abaca (musa textilis) fiber for clothes is an art found among the Manobo, Bagobo, Bila’an and Tagabili – – closely related groups of Davao and Cotabato. The groups also manufacture bolos, knives, chains and pendants by native brass casting. The weaving and casting technology is shared by the southern Mindanao groups with the Indonesian people to the south, suggesting contact during pre-Spanish times. The Bagobo tribe of Davao is known to pay more attention to dress than any other group in the Philippines. 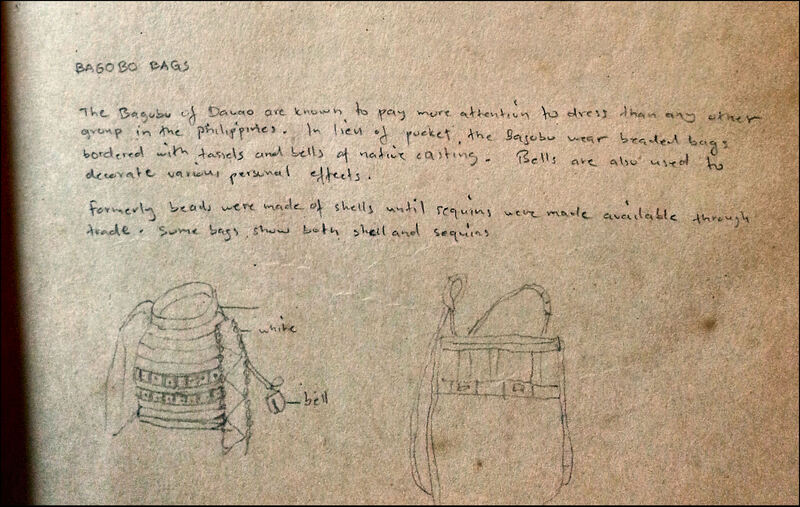 In lieu of pocket, the Bagobo wear beaded bags bordered with tassels and bells of native casting. Bells are also used to decorate various personal effects. Formerly beads were made of shell until sequins were made available through trade. Some bags show both shell and sequins. 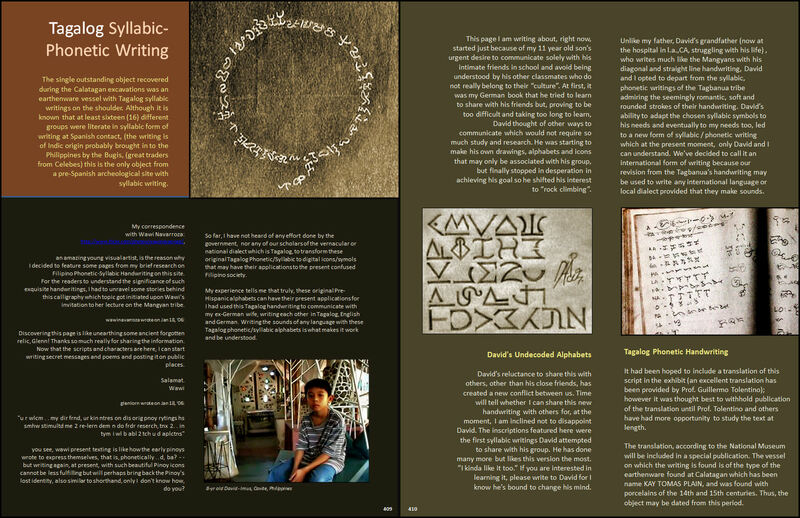 Some years back, I got to meet a certain Frederick who did much research on “Tagalog Syllabic-Phonetic Writing” which I documented using the Multiply.com site. Now that Multiply changed its format, all my precious documentation just disappeared. Saving all those images and texts were next to impossible. Everyday tools or instruments, e.g. : clay, bamboo, brass, iron, etc. . used by the Filipino minority tribes have a direct influence on how these tribes develop their handwriting. If you compare the handwritings of the Tagbanua tribe of Palawan with that of the Mangyan tribe of Oriental Mindoro, one would notice a distinct variance in the manner their syllabic symbols are written. The Tagbanua’s affinity to clay as their material for expression – – for their basic needs like food and shelter, and even for their culture, has left us considerable amount of evidence that it is primarily because of the abundance of the material they use that led them to a kind of flexible and rounded type of handwriting and a quiet type of expression in their arts and crafts, earthenwares and weaponry. 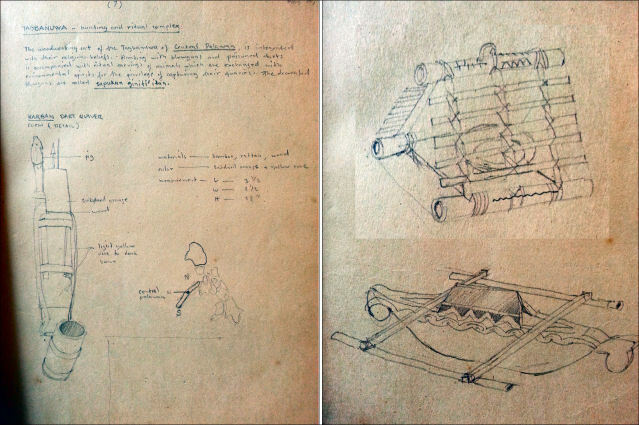 Unlike the Tagbanuas, the Mangyans lavished in the use of bamboo as a material for expression which, at present, are still manifested in their manner of voting using the bamboo. 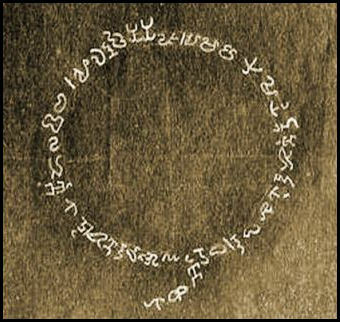 Unlike the Tagbanuas, they can only make straight and semi-circular lines using a wedge or a knife to inscribe their syllabic writing on bamboo. Everyday tools or instruments, e.g. : clay, bamboo, brass, iron, wood, hair, etc. . used by the Filipino minority tribes have a direct influence on how these tribes develop their handwriting and culture. Byron King: mind blowing. David is phenomenal. He has your creativity and curiosity. Thanks for the clarification. What is his IQ? Wondering if you ever had it tested. He seems to be an old soul. What a happy photo. 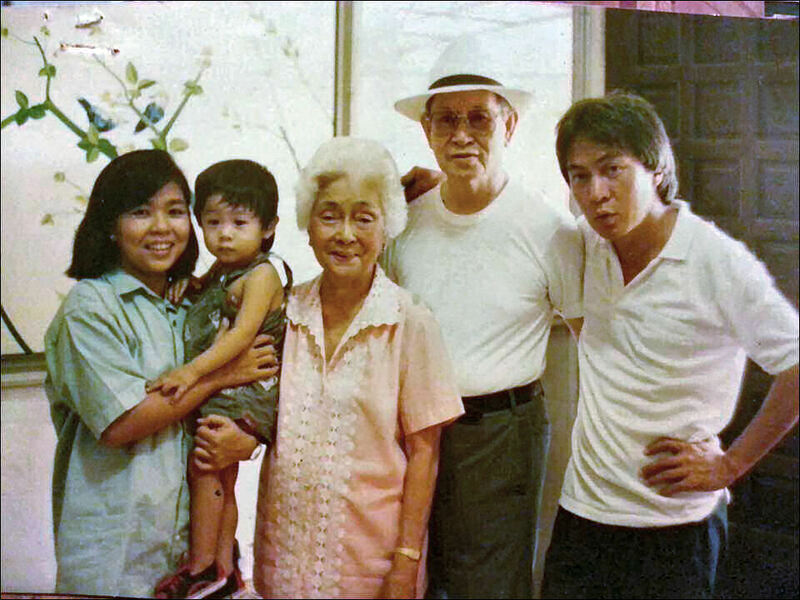 Glenn A. Bautista: Byron, David’s mom says that none of us really got tested for IQ, perhaps for fear of knowing the truth, lol! But we all feel that ’emotional intelligence’ is what we’ve got, using our ‘gut feeling’ in matters we think are really important, and that’s good enough for us. From what I have observed, Lorna, David, including myself are quite calm, organized beings who want to become a blessing to all those around us. 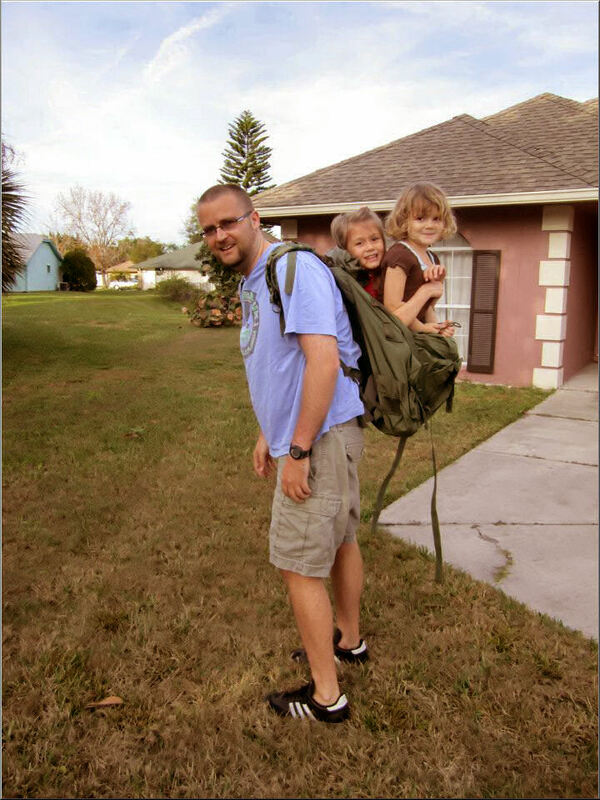 We live frugally and make the best use of our time going about God’s will and purpose while we are here on earth. What we believe and do will bring us to the next better level, whatever anyone may call it. Having met you is quite a blessing to us, as well. Stay healthy, my friend . . .
Byron King: definitely believe emotional IQ is the most important and undervalued part of intelligence. Having worked with many engineers it is often overlooked. It’s a blessing to have met you as well. Thanks for letting me share in your story. Prayers… Blessings. Let us meet on the other side for some of that mushroom coffee you speak of. No rush of course. Best…. Dante Ramos: I feel ur pain my friend. Emilio was supposed to come home for a visit this month but cancelled due to a tour he couldn’t pass up. I miss my boy like mad! How do you get over it? You don’t, this is life! Glenn A. Bautista: Hi Dante, of course d net is no substitute, but somehow we are constantly connected via facebook, skype, tango. Thanks to the internet. Yes, I remember Emilio . . is he on FB? 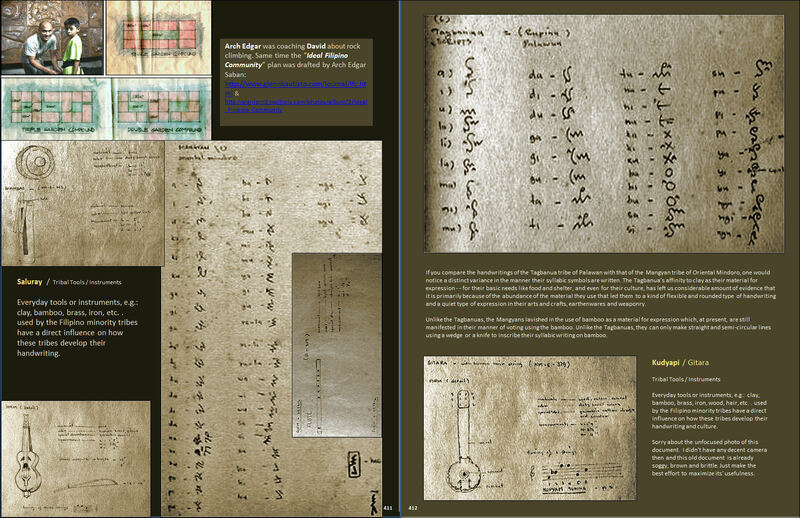 Jeanne Jacob: Re David’s alphabet, it’s fascinating! So inventive for one so young. I’ve looked at it sideways. If you turn it 90 degrees to the right, it’s very similar to Roman/Latin classical style (as engraved on stone), so that C loses its curve and instead is angular. David has added his individual touches, such as the doubling of J (face to face), the elimination of the full circle in O, and X loses one leg so that it resembles Y. Q does not follow the angular style though. Very, very inventive! Glenn Bautista: Hi Jeanne, wow, long time not see! Glad to hear from you. I am in touch with Stanley a few weeks back and heard about Elmore. Elmore was my first teacher in Art at Central UMC. How long have you been there in Bonn? I was in Dusseldorf from 1980-85. Take care and keep in touch. 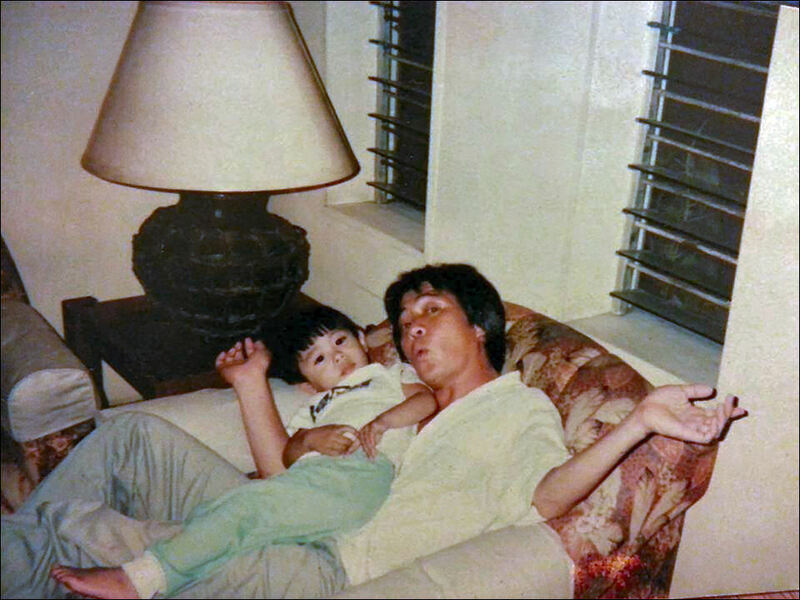 Jeanne Jacob: Yeah… really sad about Kuya El. Been in Bonn 2 years now. How did you like Dusseldorf? Jeanne Jacob: Many thanks Glenn! I love pomegranate juice – freshly squeezed. Drank it all the time in Istanbul when we were there in spring. Nothing like it. There’s a Turkish food shop here because of the huge Turkish minority, but they only carry the bottled stuff. I like reading about your healthful menus and the explanations that you give about your combinations. Wishing you complete recovery! Hi Glenn, this is very interesting. Have you found any poetry or song from Pre-Hispanic era with such writing from the natives. I hope you could give me a photo/photo copies. I am also interested to see, if you’re writing poetry, in that kind of writing. I will include it (you) in my documentation on Asian experimental poetry titled “Asie/Poeisies” (book + DVD Rom), which will be published in France late this year. Glenn A. Bautista: Still young & always young & pogi . 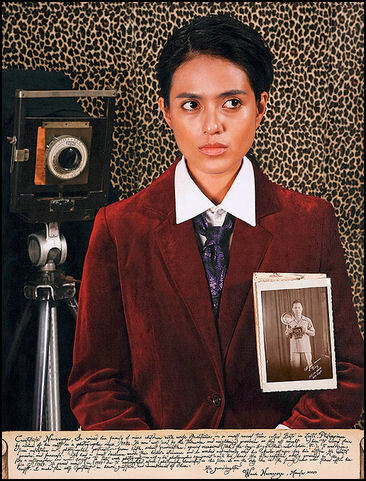 . .
Glenn Bautista: Now, really lookin’ back . . . I have to re-learn writing the way our ancestors used to write, either on bamboo, or on clay (some tribes still do, when they vote). Btw, I learned that our closest ancestors come from Taiwan. This needs more research, though.